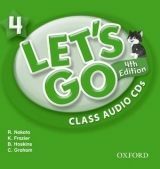 Publikace: LET´S GO Fourth Edition 4 CLASS AUDIO CDs /2/ - FRAZIER, K.;NAKATA, R.;HOSKINS, B.;GRAHAM, C.. Perfect for After School and Summer School Language Level: Beginning to High Intermediate. Interest Level: Grades K-6. Approx. Reading Level: K-4 The new Let’s Go 4th Edition provides students with a solid ...a dál?